I wouldn’t blame people for getting confused with the names and descriptions of cars these days. As a real-life example of that, I’m often asked if a ‘supermini’ would be too powerful (the ‘super’ bit has such connotations for some people) – until I explain it’s a category name given to the likes of the Ford Fiesta and Toyota Yaris. So I better try to acquaint myself and yourself with the mysterious name attributed to this week’s review car. It is called the Kia ProCeed, which they describe as a ‘Shooting Brake’. Now there’s a mouthful. ‘Shooting Brake’ was a name traditionally reserved for a certain sort of horse-drawn car and subsequently adopted by the likes of Mercedes to boost the quaint appeal of niche, posh, mechanically-propelled vehicles. 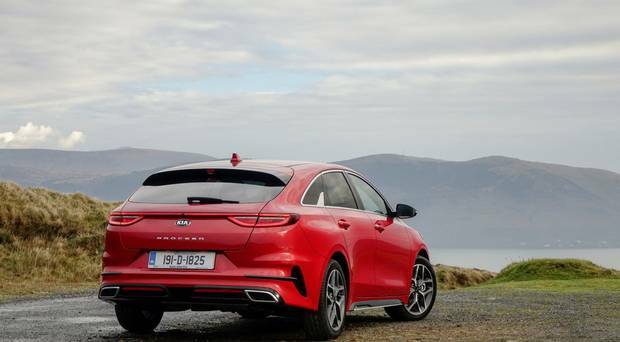 So Kia, intent on appearing to move upmarket at every opportunity, are calling their new coupé-estate-like arrival a ‘shooting brake’. If left to my own devices, I’d view it as a variant of the estate (SW = Sportswagon) and, in truth, maybe that gives the best idea of where it’s at. But really, just think of it as a smart-looking, long, curvy motor that puts more emphasis on style than anything else in the brand’s Ceed model range. I do believe there are a few things against it, though. I think mixing the ProCeed and Shooting Brake names risks even more confusion. I think it costs a lot – nearly €30,000 – for what my cynical alter ego persists in reminding me is a smartened-up estate, albeit one made specifically for European (sportier) driving and design tastes. So far there isn’t a diesel which, for me, is a pity too, considering that this has the capability of doing serious mileage in comfort. And there is only talk, at this stage, of an automatic version. You would not believe the volume of queries I get from people looking for an automatic – from superminis to luxury SUVs (not so much Shooting Brakes – no surprise there), for a variety of reasons. Most have to do with people who just hate having to shift gears so frequently in heavy traffic. Putting a serious brake (forgive the pun) on my criticisms are a few simple, straightforward but important factors. There is just the one spec and one engine (for now). You have no idea how complicated and confusing some line-ups can be these days. I believe they are totally unnecessary. The car itself looked great, despite my initial reservations. And if I liked the outside a good deal, I liked the inside a lot. Here’s how to do simple-stylish without being avant garde to the point of boring. I’m picking out the seats for special mention. They were excellent for a variety of passengers and drives, though adjusting the angle of the seat-back was just a tad cumbersome. And even though the car was low-slung, there was excellent visibility – a critical element in today’s SUV-derived craving for ‘high-driving-position’. That low stance was a major help in another area, too. It helped make loading, and accommodating, a substantial pile of stuff we shifted to the midlands just that bit easier. You can read all you like about ‘spacious’ interiors, but not until you are faced with loading up an endless assortment of black bags with God-knows-what inside, do you realise the difference between marketing puff and real-world capability. The luggage area (594 litres) had two sections and the rear seats folded flat, so we got what looked like a lorry-full in. Being able to fold the seats like that is one of modern motoring’s most overlooked advances. And when all was said and done, with just myself on board, I got a proper chance to sample the new petrol 1.4-litre engine (140PS). Now there was a nice surprise on a wet Sunday afternoon. It had a lovely turn of acceleration, was quiet and quick up the revs while the chassis engaged in a nice blend of tautness and pliancy. It was a car I could enjoy driving a lot; I liked the directness of the steering especially. However, some road noise intruded, especially from the luggage area when empty, and over only moderately rough surfaces. That was disappointing. You can get that with ‘estates’ more than saloons where the boot area is more or less separate and noise is better excluded. But overall, and regardless of what it is called, the ProCeed served me well. I think it’s a name to remember. 5dr, five-seater ‘Shooting Brake’, 1.4-litre T-GDi (140 PS) petrol, 132g/km, road tax €280. Spec includes: 17ins alloys, 8ins touchscreen infotainment system, Bluetooth smartphone integration, cloth/synthetic leather sport seats; high-beam assist, driver attention warning, lane keeping assist, forward collision-avoidance assist, pedestrian recognition.